Build a thermally efficient contemporary orangery with super-insulated columns to improve the comfort of your new room. Create your dream space today by asking Fox Windows & Doors do design your Ultraframe product. A contemporary orangery from Ultraframe will reward you with a room that feels solid and private, but without forcing you to make concessions when it comes to light. Numerous tempting features come as standard with – or can be added to the design of – your new contemporary orangery. From super-insulated columns that improve thermal performance, through to clever spanning technology, you’ll struggle to find a weak point its design. Achieve a modern look that will ensure your contemporary orangery stands out head and shoulders above all others. If you live in Kenilworth, Leamington Spa, Warwickshire – or any of the surrounding areas – contact Fox Windows today for advice or use our design tool to get a quote. Super-insulated columns can be added to your contemporary orangery design plan. This modern looking feature improves on thermal efficiency levels delivered by brick piers built to the same scale by 500%. The flexible design of these columns means they can even be sited on top of a dwarf wall, should a more classic effect be desired. Enhance the appearance of your contemporary orangery by selecting any colour. Creating a personalised look that links in with the architectural themes and style of your home will be easy when you work with the Fox Windows team. Why not create your new room online using our free design tool? You could get prices in minutes. Hidden Structural Goalpost Technology If you have plenty of space to build your contemporary orangery, you’ll be interested in the structural goalpost feature. This comes as standard with your roof and means that you can add bi-fold or patio doors up to 6.6m in width. Create stunning views, ventilate your room and link it to your garden. A Modern Orangery That’s Really A Room An insulated pelmet runs around the perimeter of the contemporary orangery and its width can be adjusted, depending on the scale of your project, The pelmet will help keep your room warm and your U-values low. Spotlights and speakers can be fitted to enhance that ever-popular authentic real room feel. 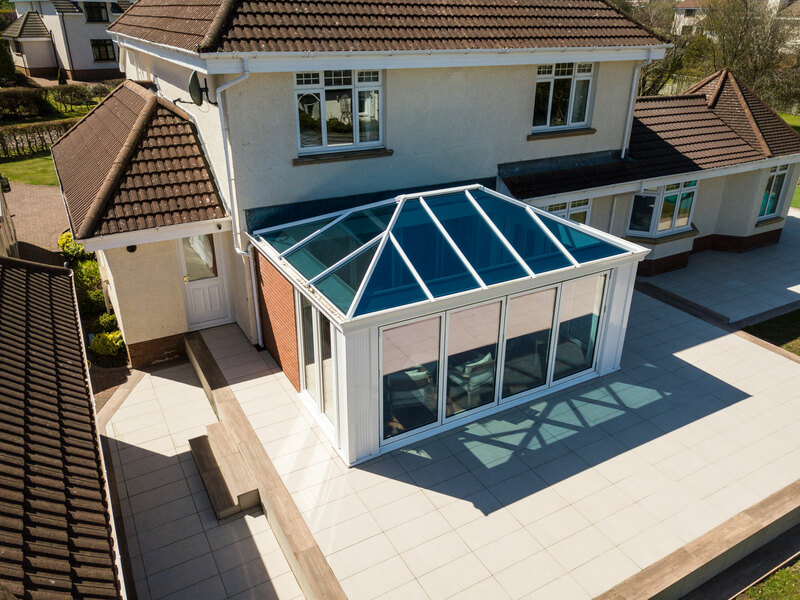 Your contemporary orangery will be built to last, Ultraframe’s Ultrasky sits at the heart of its design - an orangery roof system that uses a thermally efficient ridge to lock in heat and provide strength. Fewer bars are used in the Ultrasky’s roof, resulting in more light and improved views that can be enjoyed throughout the year. Homeowners use their orangeries as living rooms, studies and even bedrooms. This is a space you will spend a lot of time in - and so creating the right mood is important, The central lighting panel works as a decorative feature, while also delivering more light, Turn your contemporary orangery into a cosy and inviting space. It’s not just about the things you can see, it’s about the hidden technology that makes the contemporary orangery such a success. Features like the thermally efficient ridge in the Ultrasky Roof – combined with elements like the perimeter pelmet and super-insulated columns – combine to create a room that is cost-efficient to run. Orangeries are normally seen as permissible developments, providing they meet a certain criteria. But your contemporary orangery will also need to meet 2018 Building Regulations. Fox Windows understands how to build compliant designs that meet the requirements of local authorities in Kenilworth, Leamington Spa and the other areas we cover. Your contemporary orangery will function as a space for entertaining or relaxing in all year round. The glass used in your orangery roof will block more than 80% of solar rays to stop your room overheating. It will also stop warm air escaping during the autumn and winter months, so you’ll still be able to use your room whenever you want to. Visit our brand new Virtual Reality Tool to take a tour of our contemporary orangery, conservatory and house extensions. You’ll be able to look around and click on hotspots within the image that tell you about the features that’ll be included with your purchase. Make a buying decision without even having to leave your home when you choose Fox Windows. Create and preview your dream orangery using our design tool, or use our VR app to step inside your room and look around. Get an online quote today. Fox Windows is an approved Ultra Installer and meets the requirements of the Which? Trusted Trader scheme. If you are looking to build a contemporary orangery in Kenilworth, Warwickshire, Leamington Spa or the surrounding areas, you can use our online quote tool for a guide price. Talk to our experienced team by contacting us today for more information and to book an appointment.